Friendship brings great happiness with little gestures. So true – it is the little things that make up the fabric of our lives. 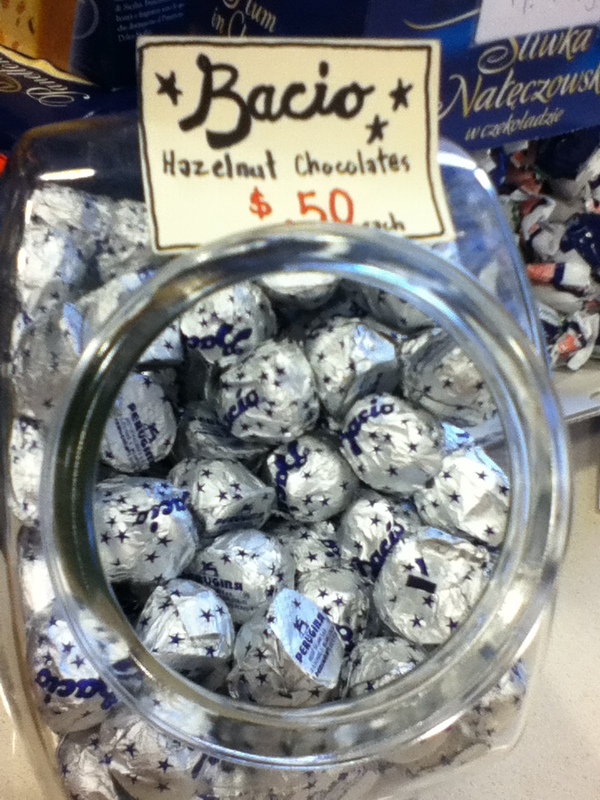 I first discovered Baci’s on my first trip to Europe, discovering the world at the grand old age of eighteen. My first foodie friend, a delectable young woman from South Africa, introduced them to me and I have to say they are still one of my favourite treats. They have a hazelnut filling that is sublime, and for extra excitement there is a whole hazelnut just under the chocolate coating. The messages they contained were exceedingly powerful when read while strolling the streets of Rome, arm in arm with my new friend, dreaming of international romances and happy-ever-after endings. Cooking together with friends is a wonderful thing to do, and you really know when you have a special connection if you can create magic in the kitchen. I am lucky that both these girlfriends and I have been able to cook together over the years, making some fantastic meals that have been shared with our families over and over as we remember the good times and great flavours. We live in different parts of the world, but as soon as we enter each other’s kitchens, the tea pot goes on and it’s like we just walked in from down the street. I just returned from Calgary where the tea pot is just now cooling off, and I feel rejuvenated as a result. I don’t have the fruit crisp recipe, as there isn’t one written down (Sue says she just “feels it”) but here is a recipe from South Africa that is a national favourite; I copied it from the piece of airmail paper I still have between the pages of one of my cookbooks. My friend Merle also claimed it never missed with the menfolk (wink wink, nudge nudge as they say in the UK where she now lives, happily married). Divide dates into 2 portions and put into separate bowls. Add baking soda to one and pour boiling water over it; allow to cool. Cream butter and sugar together until light and fluffy. Beat in eggs thoroughly, one by one. Sift flour, baking powder and salt into creamed mixture. Add dry portion of date and nuts, mixing well to blend. Stir in baking soda-date mixture – mix thoroughly. Turn into large dish, and bake at 180C (350F) for 45 minutes or till golden brown on top and knife inserted in centre comes out clean. Prepare sauce by heating sugar, butter and water together in saucepan 5 minutes. Remove from stove and stir in vanilla and brandy. Pour sauce over pudding as it comes out of the oven. Serve hot or cold with whipped cream. I am in Calgary visiting a long-standing girlfriend and it has been wonderful to catch up and have some quality “girl time”. We have been around for numerous events in each other’s lives, but it’s nice to enjoy everyday things together too. One of the reasons I always knew we could be good friends was how we could operate in a kitchen together. From a simple cup of coffee (or tea, now as we get older and don’t tolerate the caffeine :)) to a full -fledged family meal or even entertaining, we can putter away together and always come up with something that tastes wonderful and looks great, and we have fun doing it. Not only are we nourished by the food, but also by the company. Perhaps it is a mutual love of dance that helps us understand the way people need to weave in and out of a kitchen, orchestrating movements so that they are efficient and also harmonious. Maybe it is simply the love of life we share, that need to make the most of moments as they happen and take in all the magic they have to offer. 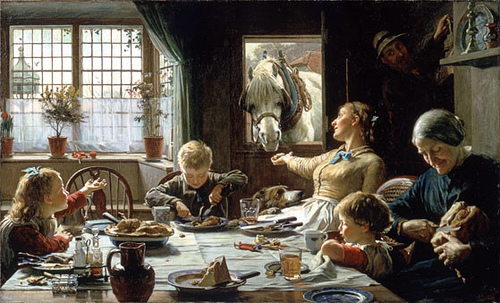 Summing up a moment with a toast at the table is a wonderful way to ensure that memory is catalogued for future enjoyment. I will be posting more on my trip to my old stomping ground in the coming week – Calgary has become a great city for us gourmands. Now I am off to lunch! Winter’s here! Enjoy the snow, then warm up the hot cocoa and get cozy. It snowed here on Tuesday. Big fluffy flakes that just floated down all day long, like someone was dusting us with Frosted Flakes. The world beyond our yard disappeared, and all the sounds stopped – no birds, no wind, no more leaves rustling, that’s for sure. The pile on the front railing just grew higher and higher. Inside, the dogs got fluffier. That may sound odd, but if you have a dog you know they are great barometers. When it gets colder and less friendly outside, they get more cuddly when they are inside. That doesn’t necessarily mean they don’t want to go outside, though. Ella, my Chocolate Labrador, LOVES the snow. She is a happy creature by nature, but I swear the snow makes her brain come loose, and she just goes loopy! She is a wonderful motivator; how can you not smile and want to join in the fun when you see someone scoot around and kick up the snow and make snow angels? Even Simon, our older German Short-Haired Pointer, who has shorter hair and is not so keen to be out in the cold anymore, will romp with her when they go out together. It snowed more on Wednesday, and again on Wednesday night, so this morning we all bounded out the door at top speed to make fresh tracks. No pristine winter wonderland at Rabbit Hollow – I have enough little footy-prints in the snow to create a labyrinth pattern worthy of M.K. Escher. “The troops”, as they are affectionately known, amuse themselves by eating snow as I shovel the driveway (Simon likes to catch it off the shovel – what can I say? Some of us are easily amused…). Then it’s off to the orchard to follow the coyote tracks or snow-doze between the trees in search of any other good scents. Once we have secured the perimeter (meaning the whole orchard, the vegetable garden, the pumpkin patch and the neighbour’s yard), then we have time for a bit of “Wild Kingdom”. (the Canadian version of “Wild Kingdom”, with Lorne Greene hosting – remember this?) Simon chases Ella through the field as fast as he can, and she outmanoevres him by doing a wonderful tuck-and-roll that lets her hop up and head out in a different direction. Simon always wins with a mock bite to her throat, but I think she enjoys the thrill before she finally puts her legs up in the air in defeat. Once this final bit of fun was complete, we could head inside – breakfast for them and me was in order. They enjoy the same old kibble with as much enthusiasm every day. For me this morning it was a delicious cup of steaming cocoa (made with a bit of cinnamon to add an exotic touch) and a bowl of Red River cereal. It made for a heartwarming way to start a cold day. "in Flanders fields, the poppies blow, Between the crosses, row on row..."
I am including a post below that I wrote for a weekly column on a local website. As I thought of all the comforts we enjoy and that were sacrificed by those that serve in battle, it occurred to me that the topic of comfort food was rather a propos. I wonder what comfort food is for soldiers… my uncle was a Captain in the Canadian Air Force and I remember sampling some of the K rations that they give out. It didn’t seem very comforting to my brother and I as kids, but away from home in the cold and the mud, perhaps a simple can of scrambled eggs and ham might bring back a glimmer of light on a dreary day. The minister who spoke at the ceremony today spoke of the Golden Rule and how that principle exists in all cultures and religions, and it is most often the cause for which people serve (“Do unto others as you would have them do unto you”). I was heartened to hear him include the Earth in his list of entities and groups. We all deserve to be treated as equals, and to enjoy a sustainable life on this planet of ours. Cheers to you, comrades, and thank you. What is comfort food in today’s world? When I was a kid, my favourite comfort food was my Mom’s tuna casserole. It was one of those “soup can” recipes, I think – it had a can of mushroom soup in the sauce part of the recipe, and it basically involved layering canned tuna, sliced mushrooms and cooked pasta in a casserole dish with the mushroom soup, and baking it in the oven. Not fancy, but good stuff. Mom used to jazz it up with those crunchy Chow Mein noodles you could get at the grocery store, and when I got older we upgraded to include chopped herbs with the soup and a bit of grated cheese on top. I wonder, in today’s world of rushing around from work to soccer practice while dropping off someone at zumba or scouts, does anyone ever sit down for a simple meal anymore, or is that kind of dinner relegated to the drive-thru window? I have written before about my memories of foods I class as favourites, easily included in the “comfort” category. Many of them are not homemade treats (Oreos are a good example) but often they did involve a homespun angle to them, like the glass of milk that had to go with the Oreos. I guess part of my comfort always came from the memory of being safe at home when the tradition was established. Then having that same thing again somewhere else is still comforting. (This must have been the reason I insisted on carry my teddy bear everywhere we went too…) You can recreate the original feeling even if the people or place are not with you, and your heart is warmed in the same way. I know that memorable visits to restaurants can certainly fit in this category too – my cousins used to love going to White Spot as a family. They claimed the burgers were in a class by themselves. I still contend that part of this experience was the shared quality time as a family, though, don’t you think? I am not convinced that time shared as everyone slams back a burger in their seat on the way to the next appointment could count similarly. I know, I’m old fashioned. Some of my friends who have children would likely say I don’t understand the pressures of the schedule of today. I have to stand my ground on this one: I believe that spending time around a dining table with friends and family is key to having a happy soul. It doesn’t have to be every night, but on a regular basis. It doesn’t have to be homemade, but that adds to the memory. Do you want your kids to leave your house only knowing how to open a box and heat things up for dinner, or do you want them to have some ammunition for starting a healthy life of their own?? Maybe your quality night could be about everyone pitching in to make dinner. To those of you who already do these things, I applaud you. Please keep up the good work. Share your wisdom with your friends. Let’s not move to the future with only things like Timmy’s commercials as the warm, fuzzy moments of how we share food and drink together. Okay, so this may be a bit extreme, but doesn't it look like fun? Welcome to my blog. Here is my first post – hooray! I hope you will come back often to see what’s new. I will be posting recipes, food & wine trivia, wine reviews, entertaining ideas, gardening info and my unsolicited opinions on the value of quality time spent around sharing a meal. I do think that the concept of enjoying food and drink with friends and family is the quintessential method of enjoying life. I hope that sharing this passion will encourage you to do the same. Please feel free to comment!